We have begun the construction of our St Joseph's Day Altar. It is not finished, we will add food, fresh flowers and wine. We have on the altar, (besides statues) St Jospeh Oil, Lourdes water, and fava beans waiting to be blessed. We are having guests, a deacon and his family over for a wonderful Italian dinner, the blessing of the altar, and devotion to the foster father of our Lord. You can read here for the history of the altars. 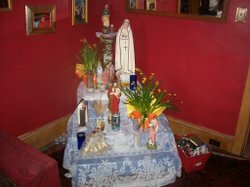 I will add photos when the altar is complete, this is for the folks who were asking me what I put on our altar. I also recommend the purchase of the book St Joseph Altars if you want to make your own altar next year. Your altar is lovely, Molly! What kind of flowers or those? They are so pretty and I was pricing lilies for our St. Joe Table and they are cost-prohibitive, I fear. The flowers are (temporary) daffodils I was given last week. I will go pick up something as it gets closer to the feast day. You've inspired me to "get moving" on ours. :) Thank you. Incidently, I love how your blog color mirrors the wall colors in the photo, such a pretty red! I love it, it's so beautiful! St. Joseph, pray for us! We are a Catholic family, home educating our children, on a small farm. We strive daily to live our faith, become more self sufficient and have fun!